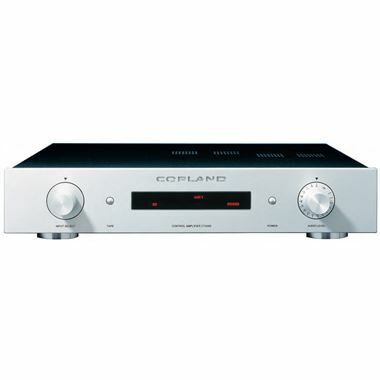 Copland CTA 305 Vacuum tube Preamplifier. Available with Online Finance and Free Delivery. Intended to be at the centre of a high performance audio system, the CTA305 is a flexible control amplifier with five line-level inputs, including a monitor loop, and a built in RIAA phono circuit accommodating moving magnet and high output moving coil cartridges. For the listener with a large investment in LPs, this amplifier provides an opportunity to recover more nuances from irreplaceable records. Besides amplifying the signal a few times and the facility of switching input sources, the primary purpose of the preamplifier is to control the sound level while matching the impedances between the signal source and the power amplifier. The amplifying and buffering circuitry of the CTA305 is composed by reliable type 6922 low noise valves. The Line stage provides 5 db. gain – perfect for today’s line level sources. It is a true Class A circuit, capable of driving an interconnect cable of unspecified electric characteristics and the input of a power amplifier while swinging 20 Volts at the output peak to peak. Polypropylene and polystyrene capacitors are used exclusively in the signal path of the CTA305, these quality capacitors eliminates blurring of sonic details coursed by dielectric losses and dynamic changes of capacitance found in conventional components. All resistors are of close tolerance film types, providing accuracy and long-term stability. Discrete dc power supply regulators with nearly zero output impedance provides stable plate and filament voltages and keeps the working conditions for the valves completely steady from a dc point of view, unaffected by the fluctuations of the ac-line voltage.